Welcome to the 2018-19 school year at Lakehill Preparatory School. We are grateful that you have chosen our school for your children's education, and we are committed to having a positive impact on their lives. Education is a life-long endeavor, and we are honored to work with you and your children during this stage of their development. As I walked through the halls this week, I have been energized by the enthusiasm of our teachers, the excitement of our students, and the opportunities available to all of us at Lakehill. 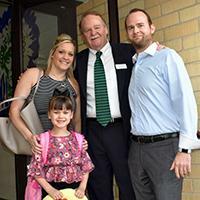 This is a particularly special year for me, as my granddaughter Kennedy joined us for kindergarten. 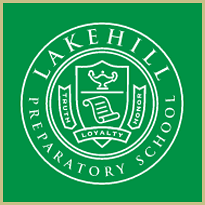 Lakehill Preparatory School has an impressive history that spans 47 years of creating opportunities for our students. While we are small by design, our close-knit community provides many possibilities for involvement. Lakehill students can find themselves immersed in the arts, athletics, academics, leadership responsibilities, and community service. Our students are fortunate that our size strongly dictates involvement over exclusivity so that everyone has their moment to shine. These moments teach our students the life skills necessary to be successful in school, in their family lives, and in their future careers. They are able to attend the colleges of their choice while simultaneously being athletes, performers, writers, scientists, artists, and community leaders. Each of us wants to be part of a strong, secure, and caring community, one in which we are valued and supported. Our goal is that every student and adult in the Lakehill family will have a safe, small place to accomplish big things. 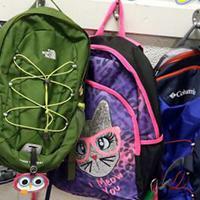 See more pictures from the first day of school. 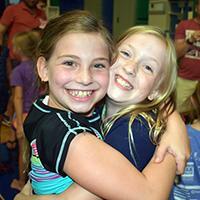 Lakehill families gathered on August 18, for the annual Back-to-School Picnic. Held on the Saturday evening before the first day of school and sponsored by the Parent Faculty Club (PFC), the annual picnic is a favorite tradition among Lakehill families. This year, families braved stormy weather conditions, eventually taking shelter in the gym--bringing the food and fun with them. The Varsity Cheerleaders performed for the crowd, and students and families made new connections with others. "Despite the weather, the turnout was great and spirits were high," said Kellie Armentrout , Chairperson for the event. 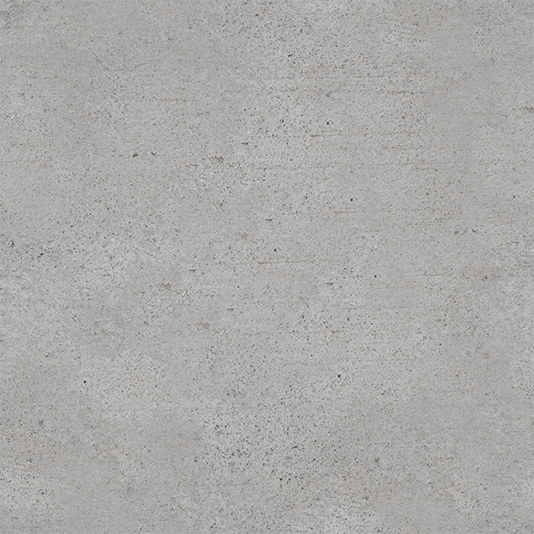 PFC President Andrea Johnston agreed. "It just goes to show that our Lakehill family can weather any storm. It's going to be a great year!" See more pictures from the picnic. 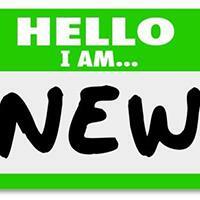 The Warrior Weekly will be spotlighting Lakehill's seven new faculty members in the coming weeks. Be sure to give these outstanding educators a warm Warrior welcome! The Academic Handbook sets the framework for helping students make good decisions. 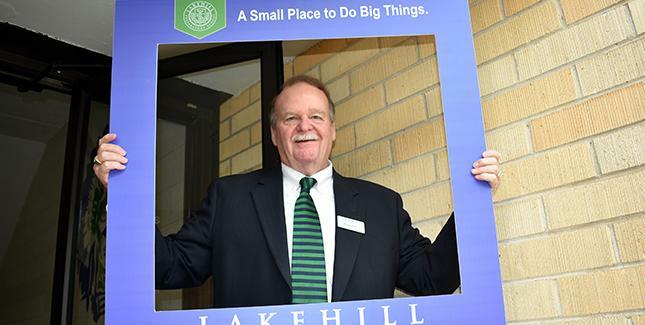 It provides in clear, concise terms the policies, procedures, and standards that govern the Lakehill community. It is a handbook organized around ideas, relationships, and expectations that bond students, teachers, and parents together through a clear and common purpose. Please take a moment to review the Student Handbook . The Lakehill Preparatory School Dress Code allows students to wear their choice of comfortable clothing while encouraging them to learn how to dress for future endeavors in the professional world. Please take a moment to review the revised Student Dress Code . 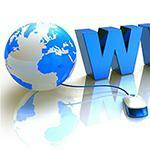 Need help navigating the Lakehill website? Take a closer look at three important sections, including Campus Life , Parents , and Athletics , all found on the top navigation bars. Campus Life - This section features the School Calendar, RenWeb (calendar and log-in), Dining Services (including the monthly lunch menu ), Warrior Web (with links to our social media and photo sharing sites), Community Service (with links to the President's Volunteer Service Award and Tracking Form), Student E-Mail, and Weather. Visit the Campus Life tab . Parents - The Parents landing page offers up-to-date information, such as Exam Schedules, link to Book Tests, Middle and Upper School forms, and the Middle School Club sign-up sheet (coming on Friday). Other tabs include Policies and Procedures (with links to Academic Handbooks, Dress Code, Students Accident Insurance, and Emergency Plan), Parent Faculty Club (with information on officers, volunteer positions, and upcoming activities), and After School Care. Visit the Parents tab . Athletics - You can find information on Middle and Upper School teams, facilities, coaching staff, athletic forms, the Athletic Handbook, and directions to games. Visit the Athletics tab . On August 22, Upper School students gathered for Lakehill’s second annual Club Fair. Many returning clubs presented, most notably Sisteens, PASF, and Science Club. Other clubs shared information on possible outings hoping to entice students, such as Mr. Guerra, who discussed an Eats and Theats outing to see a Lakehill student in a community production. Several new clubs were also introduced to students, including the Weightlifting Club, which will be led in mornings at the ESC by Coach Neyland and Mr. Jones. Upper School clubs welcome all students and those interested in joining should attend the first meeting which will be addressed in the morning announcements. Middle School students will have a variety of club offerings, including Community Connections,Cooking, Drama, Debate, Engineering, Magic, Math, Soccer, and Weaving. Club sign-up forms for Middle School will be posted on the Parents Landing Page on Friday. Lower School students will also have a plethora of clubs available to them, ranging from computers to fun and games to community service. 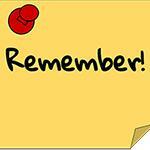 Information on Lower School clubs will be sent home in Friday Folders on September 7. The JV and Varsity Volleyball teams began their 2018 season on August 1. Lakehill will once again compete in TAPPS-3A against Rockwall Heritage, Dallas Lutheran, Dallas Covenant, The Highlands, Yavneh, and district newcomer Texoma Christian. The teams are composed of freshmen Madison Deason , Sydney Rutherford , Graysen Walker , and Brooklynn Williams . Maya Ariss , Krista Carlson , Maddie Cerda , Katherine Mahan , and Jourdyn Owens are returning sophomores. The junior squad of Liz Blanchard , Loveth Heard , Claire Howard , Stella Palmer , and Lynley Waggoner join seniors Julia Bartholow , Macy Ellis , and Tyler McCall to round out the upperclassmen. The Varsity team is currently 4-0 to start the season after beating Garland Christian on August 21, in straight sets. The JV team is 1-0 after winning their season opener on the same night. Varsity will play in the McKinney Christian Tournament on Thursday and Saturday. JV will return to action with Varsity on August 28, when they play Waxahachie Prep on the road. Game times are 5:00 p.m. for JV and 6:00 p.m. for Varsity. The Varsity team is coached by Jhoana Cayme-Mosley , and the JV team by Jenn Dixon . The start of school also means the start of fall sports for Middle School. 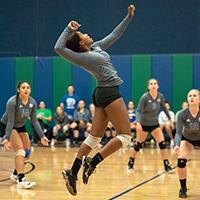 There are a record number of girls playing volleyball this year. With nearly 30 athletes for both the Blue and Green teams, it looks to be an extremely promising year for the Middle School program. This year, the program is led by coach and Lakehill alumna Alisyn Schreiber . Coach Schreiber graduated from Lakehill in 2008, but has had a long family history with the school. Her mother Pam graduated in 1976, and her brother Kenny graduated from Lakehill in 2004. 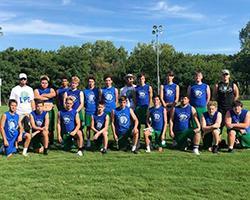 After being named champions of their summer six-on-six passing league, t he 2018 Lakehill Warrior Varsity Football team is ready for a great season. The team had its first scrimmage on August 17, and will host another on August 24, at 6:00 p.m. at the Warrior Athletic Complex, against McKinney Cornerstone, Longview Trinity, and Forestburg. “The scrimmages are a great opportunity for all of our players to have playing time and gain valuable experience," said Head Coach Rob Vaughn . The Warriors open the regular season on August 31, at Bracken Christian School in Bulverde, Texas. Vaughn is assisted this year by Jimmy LaBrie and Ryan Stone . The Middle School team, coached by LaBrie , with assistance from Vaughn and Stone, will kick off their season on Thursday, September 13, at 5:00 p.m. against Dallas Lutheran. Varsity Cheerleaders were recognized as recipients of the Award of Excellence at their summer camp hosted by Premier Cheer Camps. The team was honored for their outstanding sportsmanship, spirit, and growth. They are coached by Mylana Burt . Co-captains are Georgia Ferguson and Tyler McCall . 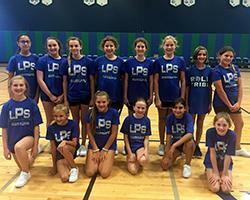 The Middle School Cheerleaders enjoyed a day of cheer camp on Saturday, August 18. With an instructor from NCA leading the group, the girls learned cheers, chants, jumps, stunts, and dances, impressing the instructor enough to earn excellent ratings across the board. The squad is currently practicing for their first Pep Rally in September and the first Middle School Football game on September 13. The squad is coached by Kaye Hauschild and Tam Badgett . The Cross Country team will compete on August 24, in the Friday Night Hawk Invitational, a large, public school meet at McKinnish Park in Carrollton. Middle School racing begins at 6:00 p.m., followed by JV and Varsity - come cheer on your Warriors! The team is coached by Karen Owen . Get ready for more live broadcasts and on demand coverage of our biggest sporting events and performances this year on the National Federation of State High School Associations (NFHS) Network. Sign up for a monthly pass for $9.95, or take advantage of the special Annual Pass for only $59. Find out more and sign up . The first live broadcast will be the Tailgate Game on September 14. 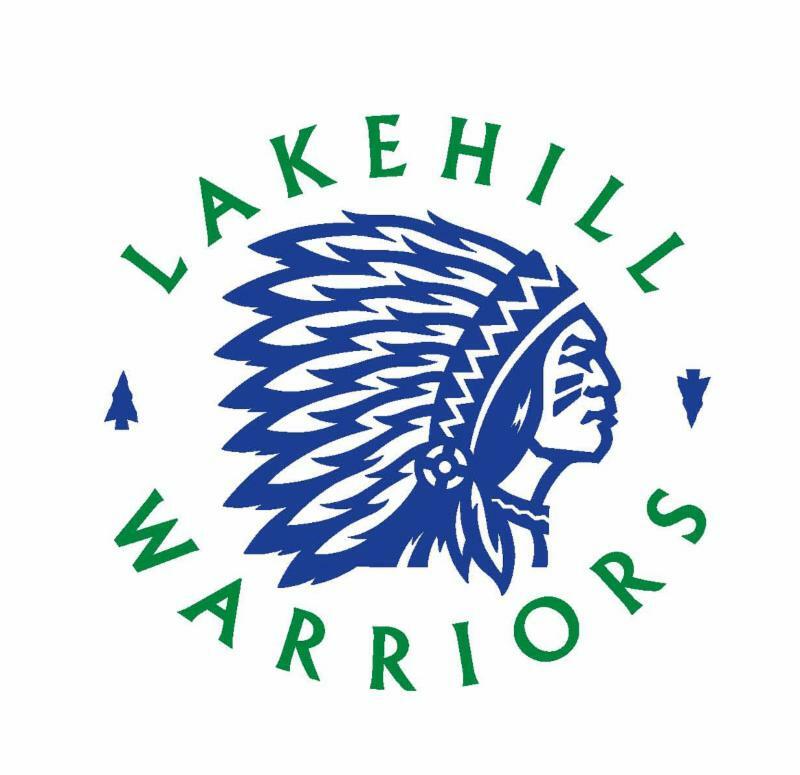 Tribe Meetings, 8:45 - 9:30 a.m.
Current Lakehill families are invited to visit with their children's teachers and learn more about the expectations for the coming year. Please note: This is a parents-only event. Join us at Lakehill's adopted shoreline at White Rock Lake to help clean up this neighborhood treasure. Meet at the parking lot at W. Lawther and Chapel Hill. All supplies will be available. Breakfast will be provided. 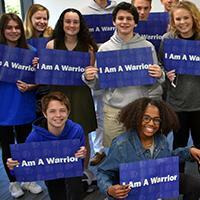 Don't miss out on the first Pep Rally of the year on September 14, from 1:40 - 2:05 p.m. Then head to the Warrior Athletic Complex as the Varsity Warriors take on Fairhill. Enjoy the annual Tailgate Party before the game with hot dogs provided by the PFC and other refreshments available at the concession stand as we cheer the Warriors on to victory. Kick-off is set for 7:30 p.m. Go Warriors!